Provide comfort for the family of Irene Lange with a meaningful gesture of sympathy. 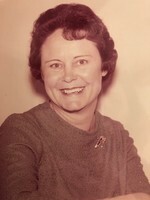 Mrs. Irene Elizabeth Lange passed away peacefully on Thursday, Dec. 27 at the age of 96. She was born on Oct. 9, 1922 in Mart, Texas to Paul and Lydia Lebkowsky. She attended Riesel High School and married Walter Lange in 1946. They made their life in Waco where Irene resided until her final days. Irene was an avid fisherman. She loved bank fishing with her father, Paul and enjoyed the competition of the sport. She found great joy in cooking, baking and gardening. Mrs. Lange was preceded in death by her husband Walter, of 51 years; parents Paul and Lydia; brother Charles Lebkowsky; sisters Paula Lebkowsky and Mabel Fleischhauer; step-mother Billie Lebkowsky and step-brother Norman Denney. Survivors include her brothers Leon, Roy and David Lebkowsky and sister Cynthia Lebkowsky. Mrs. Lange will be laid to rest at a graveside service in the Riesel Cemetery on Saturday, Dec. 29 at 10:00 am. To send flowers in memory of Irene Lange, please visit our Heartfelt Sympathies Store. Provide comfort for the family of Irene Lange by sending flowers. My sympathy to the family, especially Cindy for your loss. How wonderful that she was able to live in her own home for so many years. June Hayman related through my great grandmother Marie Lebkowsky Ehlers. My condolences to the Lange family during this difficult time. In the Bible, Jehovah God gives us hope. Acts 24:15 says, “there is going to be a resurrection of both the righteous and the unrighteous.” Revelation 21:4 says, “and he will wipe out every tear from their eyes and death will be no more.” Very soon we will see the fulfillment of these promises here on Earth.